Spirits offers countless time and money saving features that will allow you to efficiently manage your business while focusing on what’s important: Keeping your customers satisfied and spending! Age verification prompts the cashier to check the customer’s identification and informs them if the customer can legally purchase age-restricted products. C-Store allows you to dynamically customize your product pricing within seconds to accommodate coupons, sales, and other discounts. Experienced and certified installation professionals ensure you are up and running in no time. We provide preliminary onsite training and extensive remote training to make sure you are proficient with your POS system. In-house customer service and technical support are available 24/7; remote support allows the Harbortouch support team to access your system to repair any software issues immediately. Our certified technicians are highly trained in order to provide a superior installation experience. Our onsite technicians provide a basic overview at the time of install to make sure you are comfortable with your new system. No matter when you have an issue, we will be available to help you reach a quick resolution. We work around your schedule to complete the installation, avoiding any disruptions in your business operations. Once the installation is complete, we provide an advanced training session over the phone so that you can utilize all of the features and functions of your POS system. The support team is able to log in to your system remotely to instantly repair any software issues you may experience. The heavy-duty cash drawer protects against theft and also includes a cash till to keep your bills and coins organized. The extremely reliable, high-speed thermal printer quickly provides receipts for your customers. A barcode reader makes customer checkout quick and easy. Allows customers to view the price of items sold or you can display a promo message for marketing purposes. The included keyboard provides another convenient option for entering text into the system. 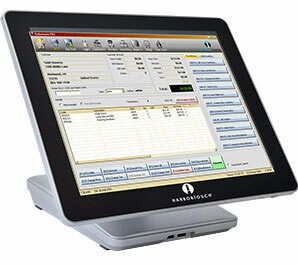 In addition to touching the screen, you can easily navigate your POS system using the included mouse. Each Retail system includes 5 employee cards to track labor hours and manage employee access. Enable PIN-debit transactions with highly secure, encrypted PIN pad. Add extra employee cards to track labor hours and manage employee access.